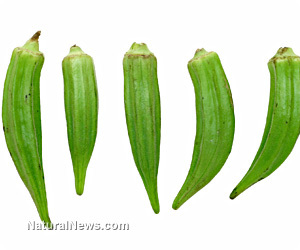 (NaturalNews) Okra is available the entire year in the southern lands, but for Americans, it is only available during summer. The appearance of okra is comparable to that of a grooved pepper, and it belongs to the same genus as both cotton and hibiscus. Food experts said that the most likely origin of this vegetable is Africa, and it was transported from there to the United States about 300 years ago. Okra looks appealing with its tender leaves and fruit. But its most outstanding feature is the fruit's gelatinous and slimy juice that gets released and mixed into sauce or soup during cooking. That gelatinous, slimy juice is a favorite ingredient in soups and gumbos. But if the juice is not to your liking, you can try frying it quickly along with cornmeal on a saute pan. It is important that you take advantage of this wonderful fruit for all the health benefits that it can give. This vegetable is packed with fiber, which is good for cholesterol management. It has been found to contain folic acid and vitamin B6 with amounts equivalent to 1/10 of the recommended daily intake for Americans. Okra plant grows naturally in regions that have warmer climates. South China is one such region. Kantha Shelke, from the Institute of Food Technologists, said that okra was the vegetable served to Olympic athletes during the Beijing Olympics. She added, okra is also called "plant Viagra" in the US and "green panax" in Japan, due to the physiological effects it can bring. The okra fruit has been found to contain polysaccharides, food nutrients that can improve blood flow the way Viagra can. Back here in the US, Americans are still in the adjustment period with regard to the use of okra. It is gaining popularity in some quarters but not with the mainstream American consumers. Shelke, a researcher on food trends, pointed out that okra chips are popular in vegetarian and Indian restaurants. Another vegetable researcher, Eugena Yoo of the New York City Green market, said that New Jersey foreign communities tend to favor okra over other vegetables for its purported health benefits. Okra contains vitamins, minerals and the antioxidants epicatechin, catechin, rutin, procyanidin B1 and B2 and quercetin. These antioxidants are capable of preventing damage to cells caused by environmental factors and stress. Anti-diabetic effect - the fiber in okra is able to slow down sugar absorption to the blood. Lipid-control effect - The soluble fibers of okra, called pectin, are able to lower blood cholesterol by 10%. Brain-function-improvement effect - Shelke reported that people in Southeast Asia, the Far East and the Middle East eat okra for the purpose of improving brain functions. Though new in the medical arena, okra is gaining popularity fast. If anyone is suffering from diseases or needs nutritional supplementation, incorporating okra into the diet may just be one of the best steps to take.